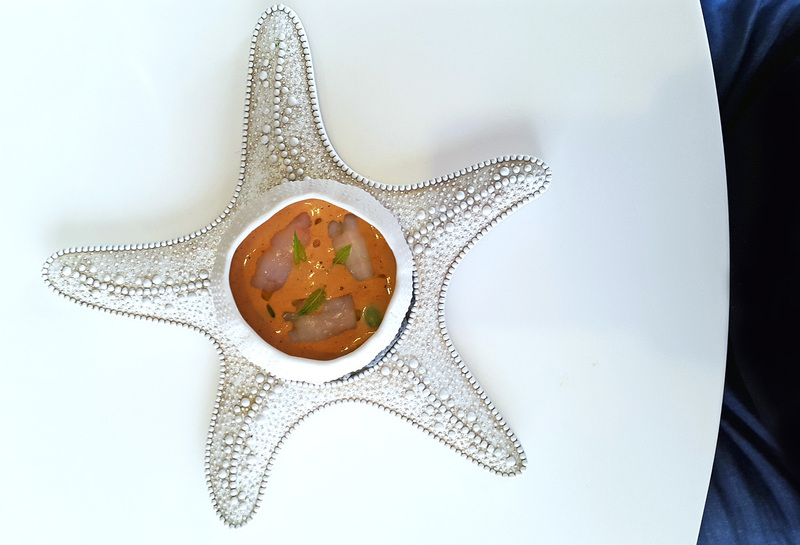 Quique Dacosta – 3 stars in Denia , Spain..
Quique Dacosta , one of a very special breed of premier chefs from the category of “ There`s Chefs…..and then there`s Chefs”. 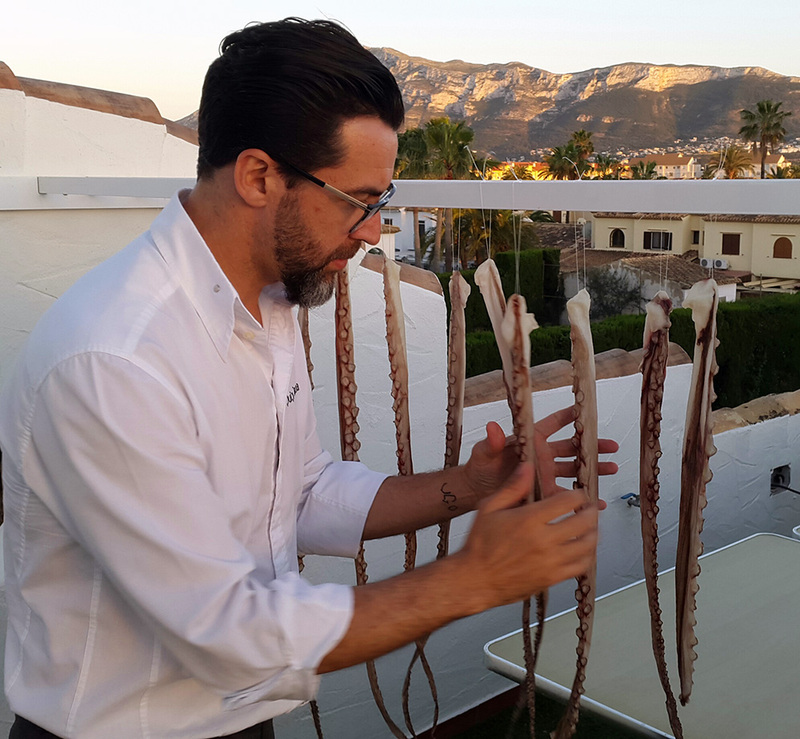 I was extremely blessed to spend the weekend with Quique and his teams at his flagship restaurant in Denia and also his 3 other busy establishments in Valencia – El Poblet , Mercatbar and Vuelve Carolina. My sidekick on the trip was fellow top level food geek Mr Finediningexplorer. Now you`ve all seen Laurel and Hardy so I shall say no more. Maybe we should be on a stage performing somewhere as a double act. Quique started working at the restaurant in 1989 when he was 17. 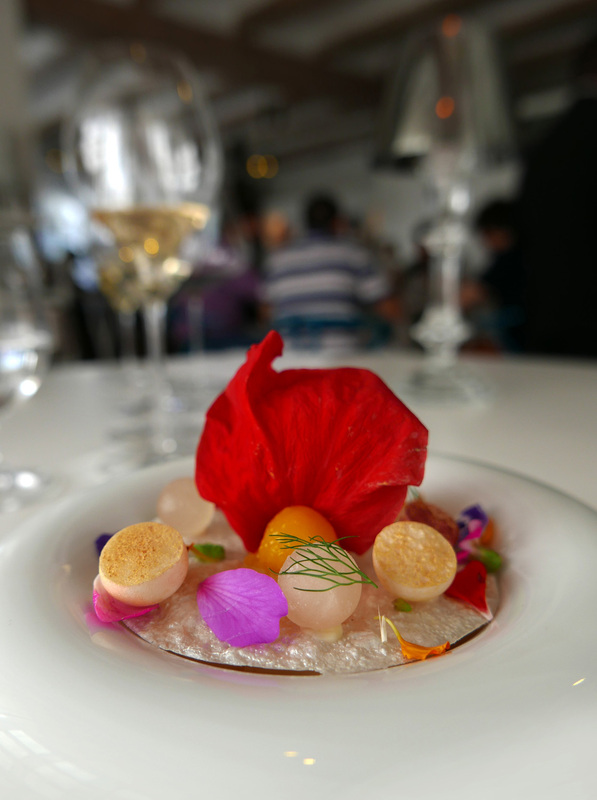 Originally it was a traditional Spanish restaurant called El Poblet. 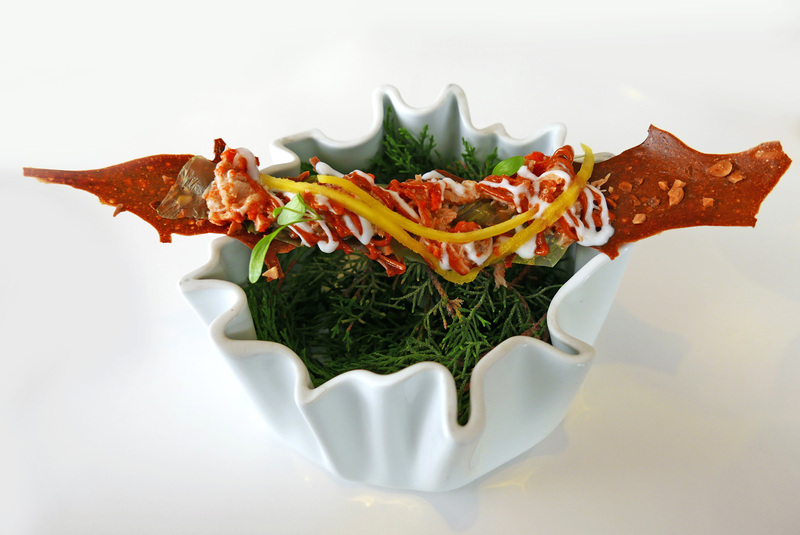 Quique took over the business after spending 10 years there and in 2003 the restaurant got its first star. The second followed in 2007 and finally the third star in 2013. 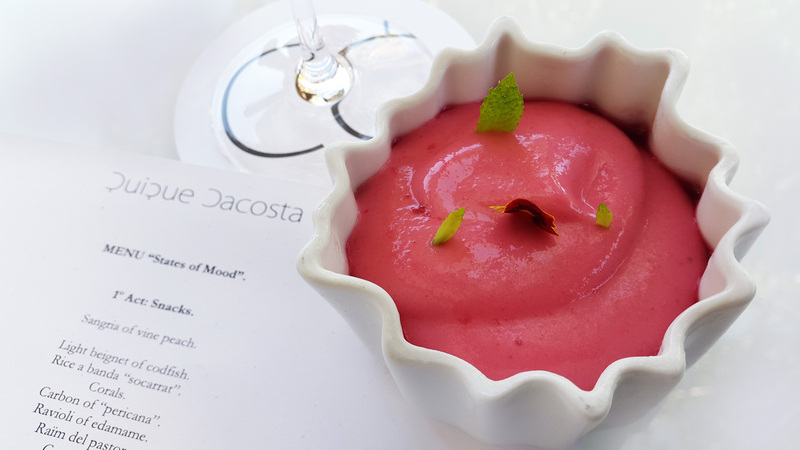 The restaurant was renamed Quique Dacosta and a new restaurant opened in Valencia under the original name of El Poblet. 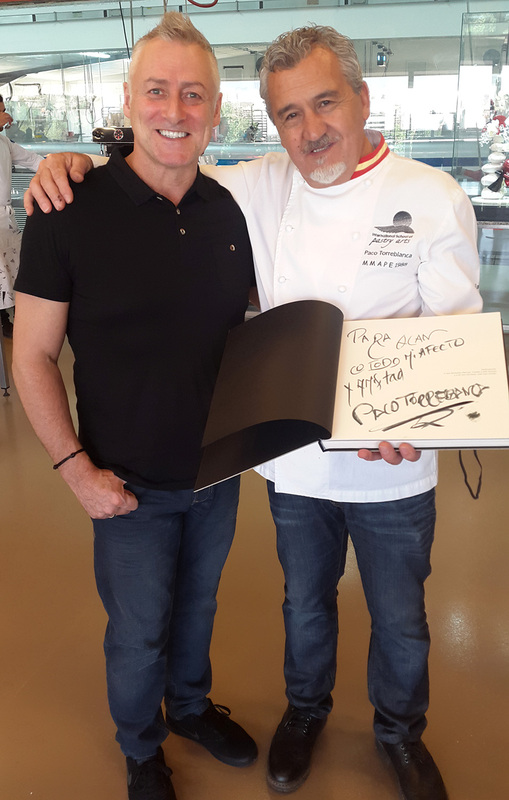 After an overnight stay in Elche , the first call of the day was to the town of Elda to meet one of the Worlds best pastry Chefs, Paco Torreblanca. 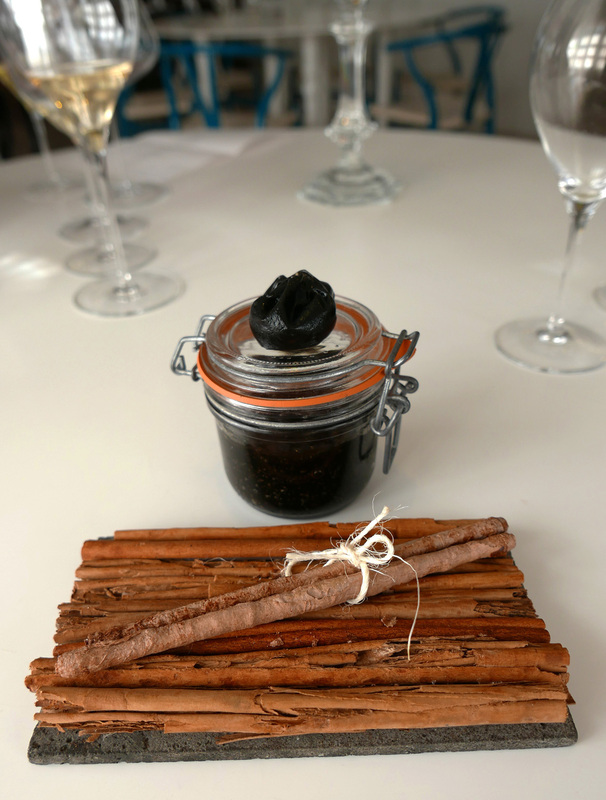 Paco climbed the ladder at the same time as the Roux brothers and Pierre Herme and now sits right at the top of his game in the world of sweet treats .The trip to his laboratory was akin to a walk into the world of Willie Wonka. 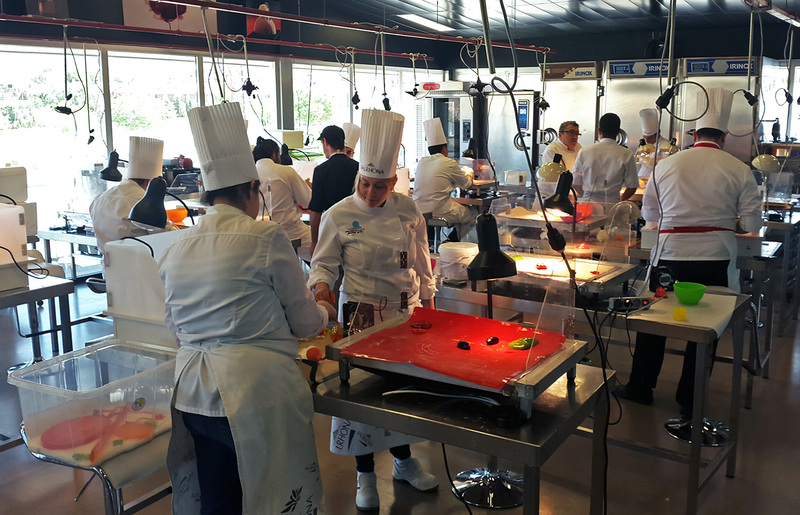 The Workshops were full of students from USA , Brazil , Italy and Spain making sugar bubbles and Roses – impressive. Paco is very much old school and a total master of his art. 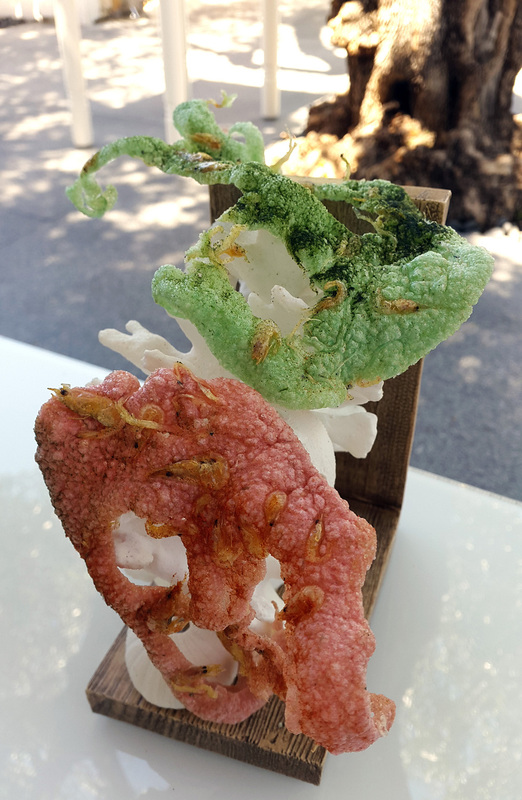 Examples of his sugarwork were on display throughout his workshop and a huge selection of pastries , Pannetone and Macarons were there for the sampling. 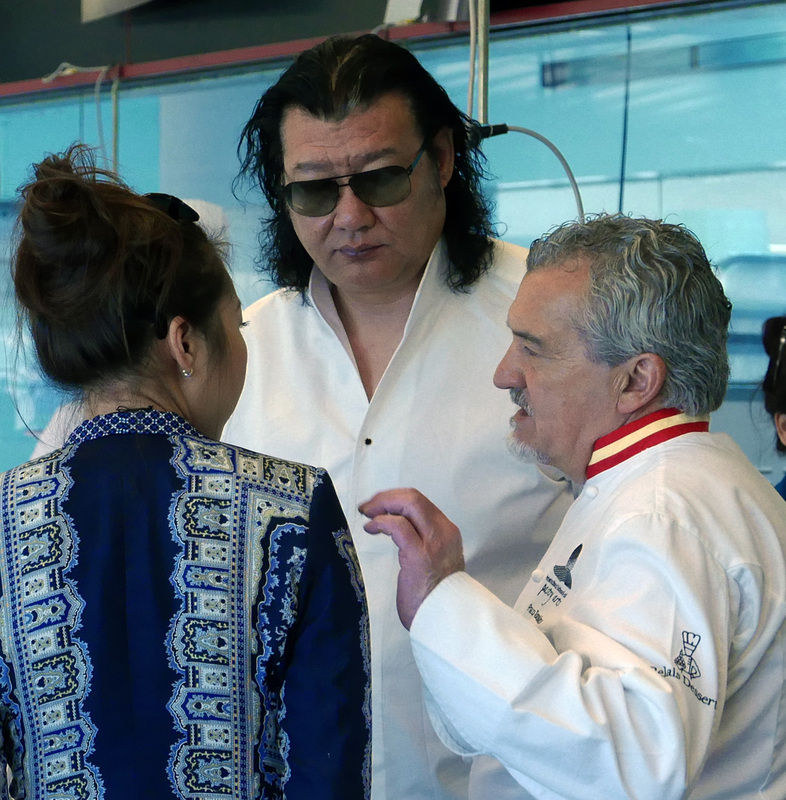 The thing that impressed me most about Paco is that he`s managed to keep alive his culinary roots but he`s also moved along with the times as well. 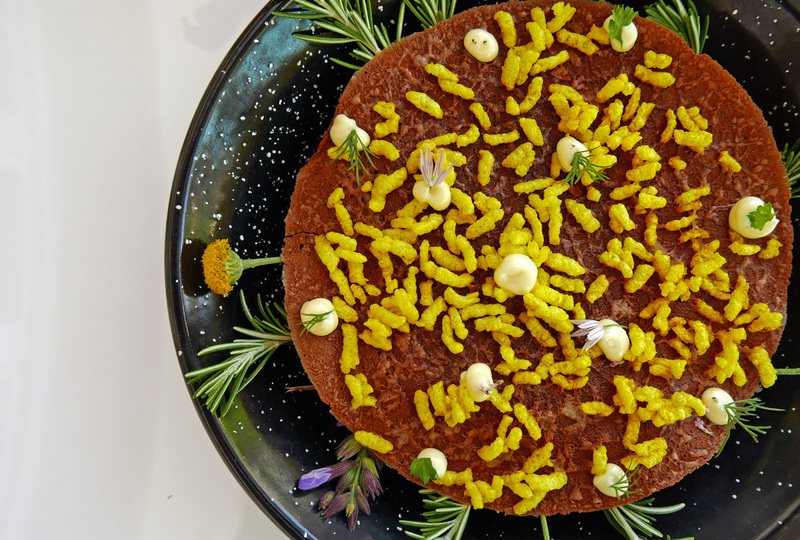 Highly skilled examples of Pacos Molecular desserts adorned the many cookery books on display at the workshops and I was most impressed by an edible notebook complete with a Chocolate spiral ring binder inserted to keep the leaves together. There was also another visitor looking around while we were there. DaDong the Chinese God of the Peking Duck was touring Europe to see what new culinary ideas he could take back East. A one hour drive to Denia came next and then straight into Quique`s restaurant for lunch. We were warmly greeted by Quique and his manager Didier and before we knew it the show was underway. The Spanish sun was hot that afternoon but ice cold Champagne and our first snack of chilled Vine Peach Sangria soon sorted the heat problem out. 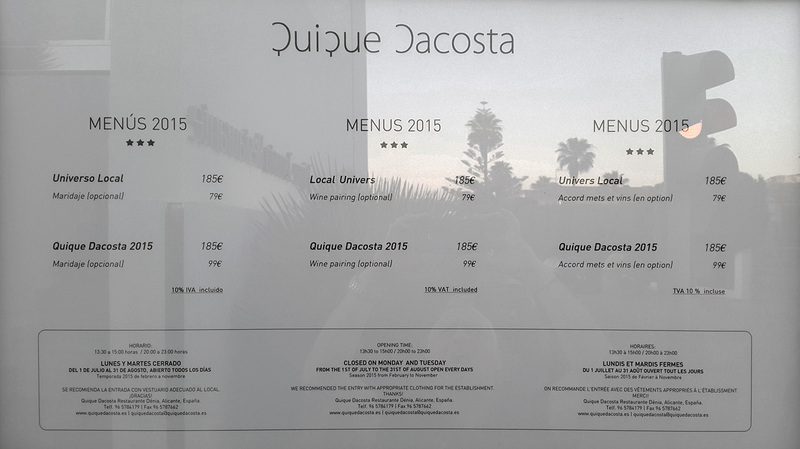 There`s not many restaurants at this level that totally change their menu every year but at Quique Dacosta they do exactly that. 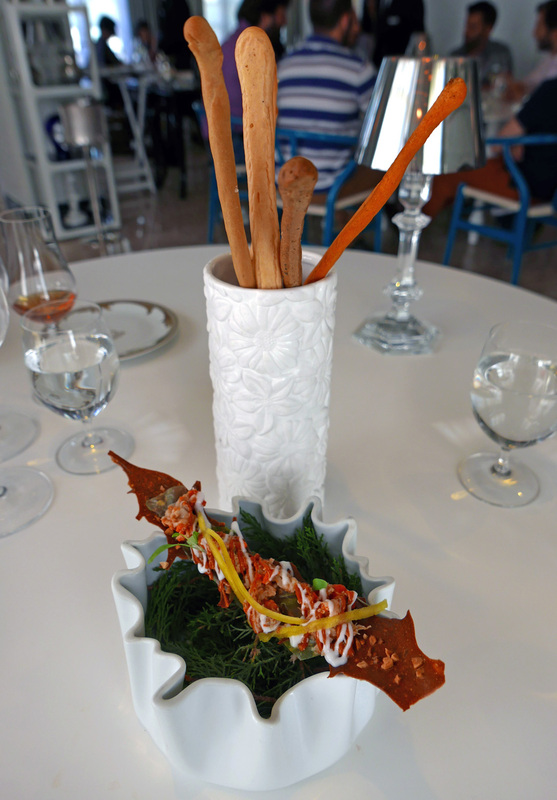 40 new dishes were introduced at the start of the 2015 season and we were here to experience Quique`s latest delights from his new menu “States of Mood” .The menu here normally showcases the Red Denia Prawn but for our lunch we were to give that a miss because we had very special plans after the meal. We would go with Quique to the fish market and get our special Red Prawns directly off the boat , straight through auction and then back to the restaurant. 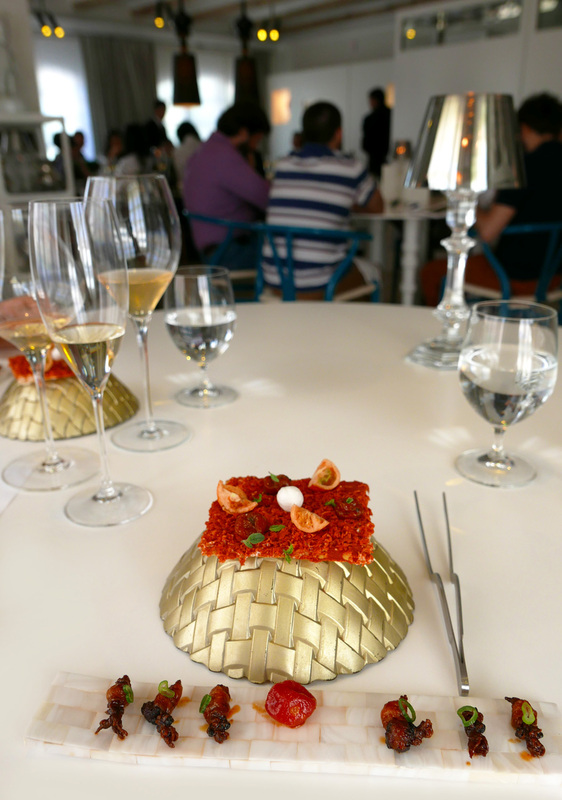 Our evening dinner would be a celebration of the Denia Prawn cooked in the development kitchen….Enough said , wait for the next post. 1, Sangria of Vine Peach. 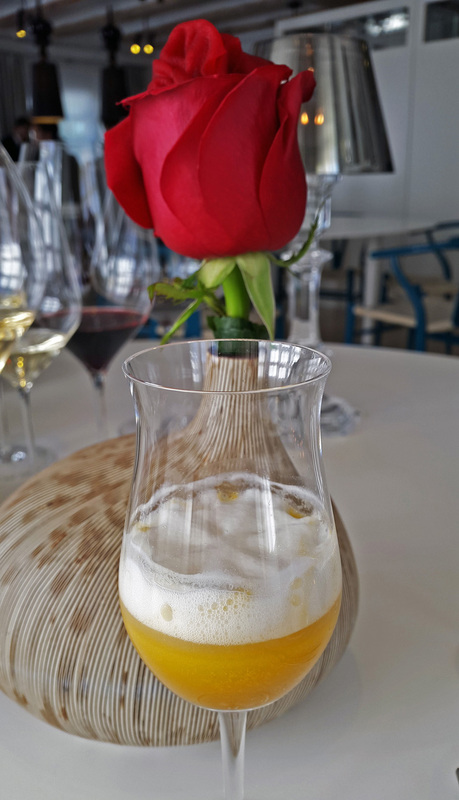 – This was served in the style of a semi frozen slush drink , very refreshing in the afternoon Spanish heat. 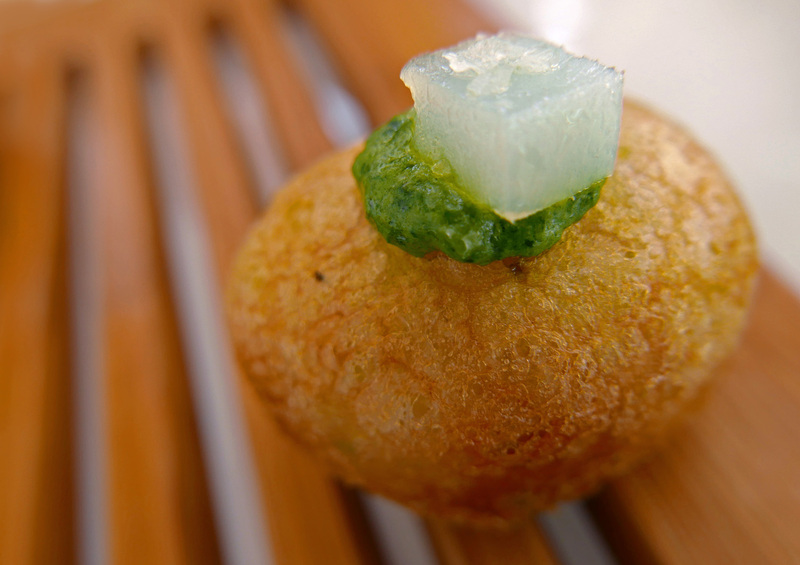 2, Light Beignet of Codfish. 3, Rice a banda “Socarrat” – Socarrat is the layer of toasted Rice at the bottom of the Paella pan.This one was Quiques translation of the same thing. 4, Corals. Dehydrated sea flavoured Rice crackers with delicate little prawns incorporated into them. 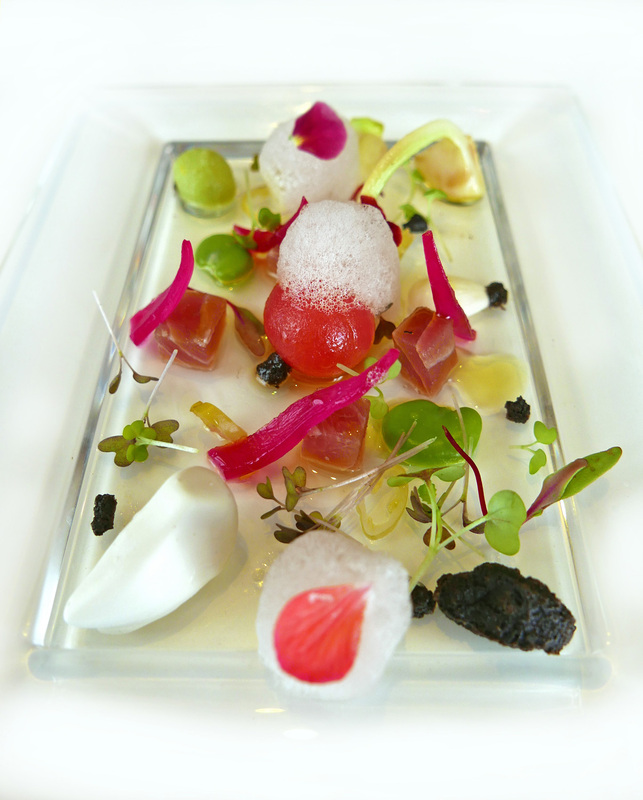 5, Carbon of “Pericana” – This amuse definitely impresses. 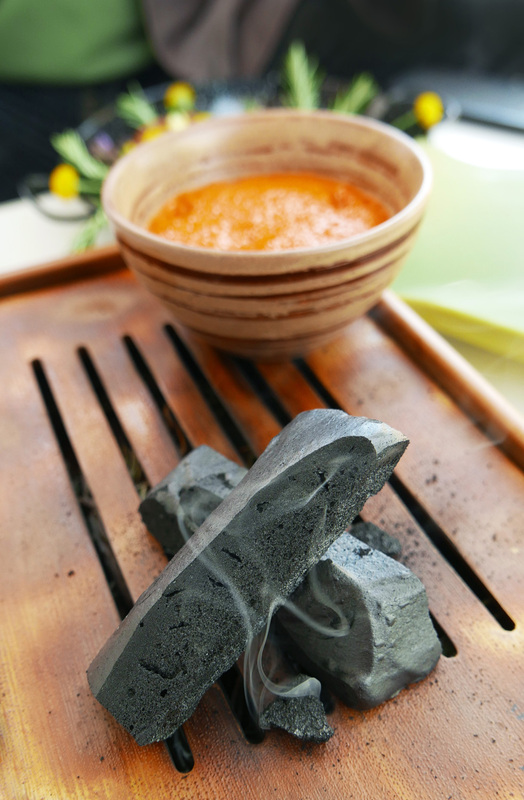 The smoking hot Charcoal comes with a traditional regional creamy sauce served as a dip. 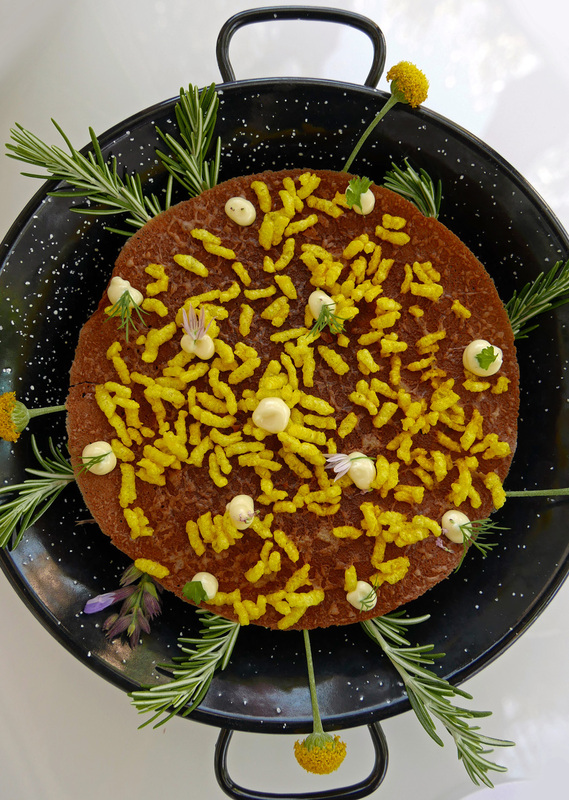 It`s called Pericana which is made of dried Peppers and salted fish . I looked around for some bread or a spoon but all there was to dip in was the hot Charcoal , still emitting smoke. 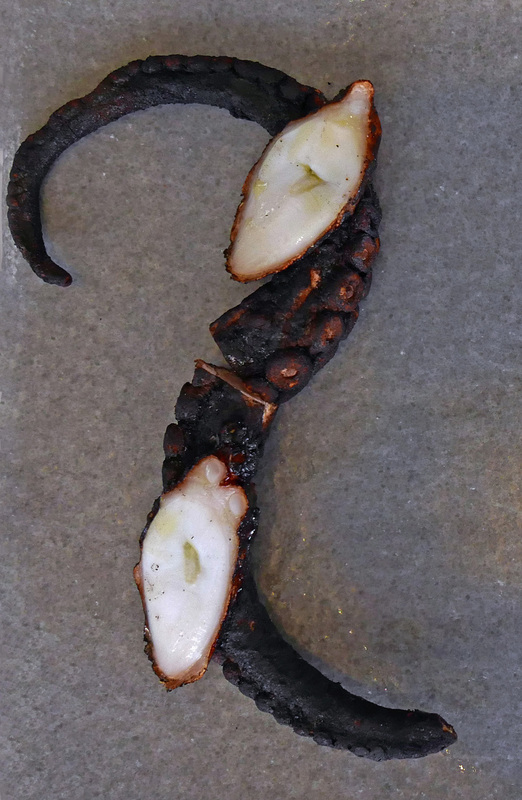 I picked the Charcoal up cautiously only to discover it wasn`t burnt wood at all. 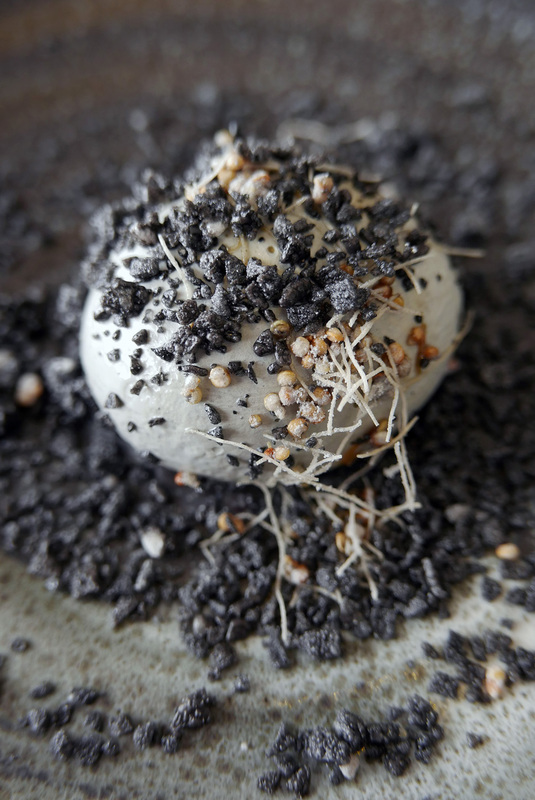 It was infact a savoury Meringue dyed Black with Squid ink. The smoke had come from a smouldering bed of fresh hay which was sitting hiding in a tray underneath…Marvellous and very quirky. 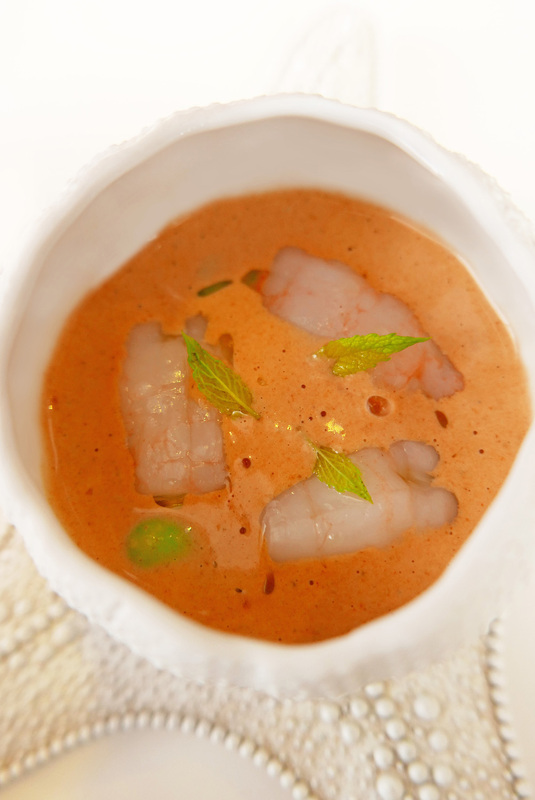 6, Ravioli of Edamame – The Ravioli is filled with crunchy Edamame Beans mixed with a Kimchee flavored sauce….like a rich Tomato soup. 7, Cordifolia – This plant is locally picked in Montgo national park. It`s called Raim de pastor ( Sedum Sediforme ) but more commonly known as “Stonecrop” in the UK. 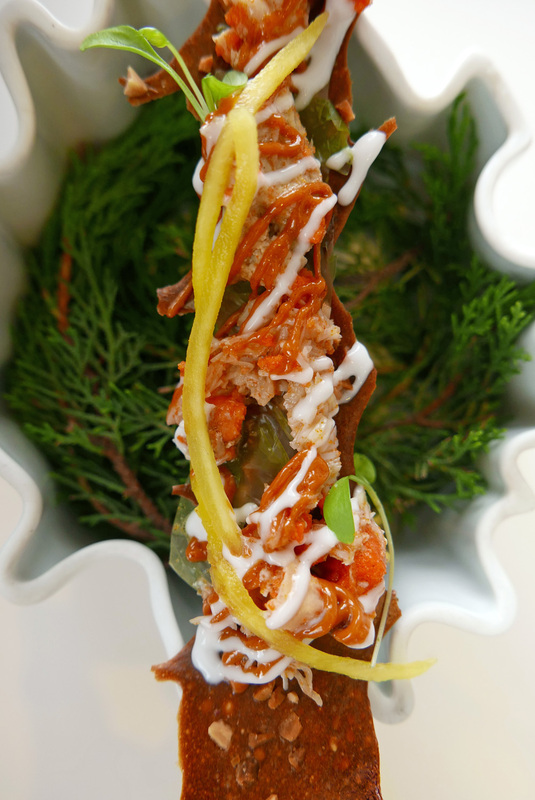 It has a taste that is reminiscent of pickled capers and it`s served as a little amuse to create smiles and discussion from the customers. Eat the leaves and stem and then chew on the root… Simple. 8, Mojito of Ginger….and walk this way sir. This was a little iced refreshment served to us outside. 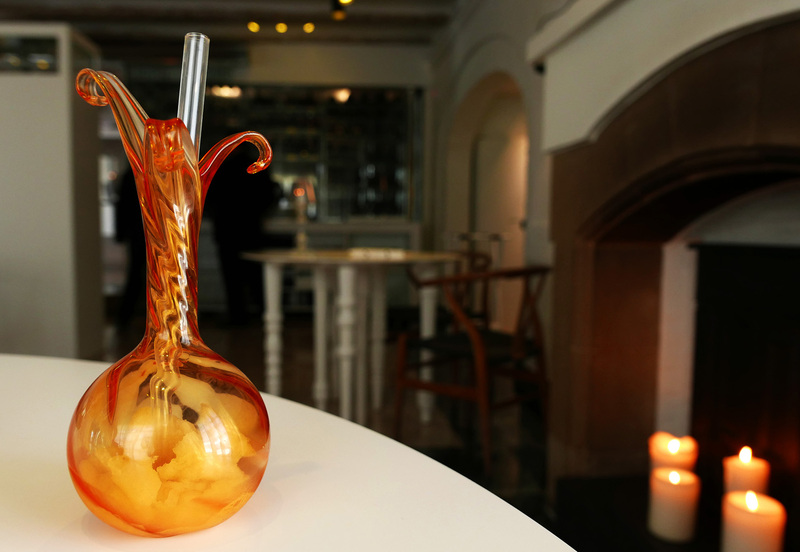 We were meant to sip the frozen slush from a straw on the way through to our table but I struggled badly to get anything up the straw and was pretty frustrated when I couldn`t get a spoon inside to scoop out the wonderful goodness in the glass. I defrosted it by hand and slurped it noisily down. 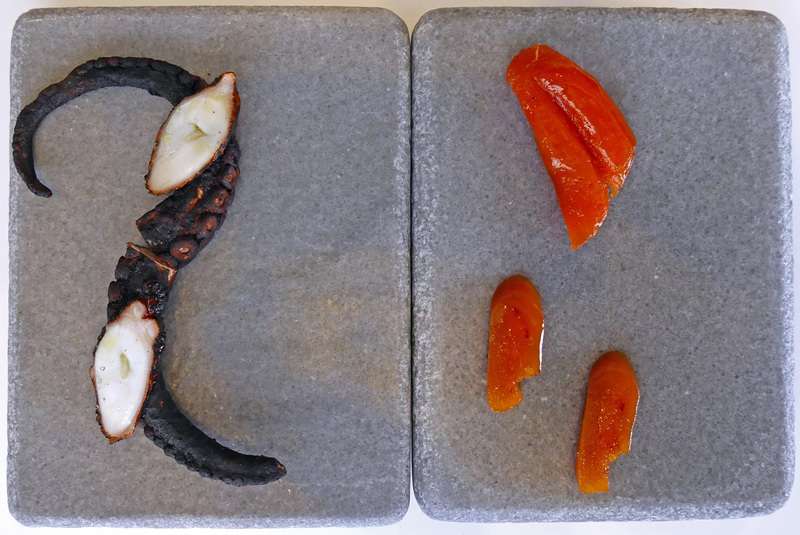 9, Dry Octopus – Dried in the sun on the roof of the restaurant. 11, Salad of Pickles. 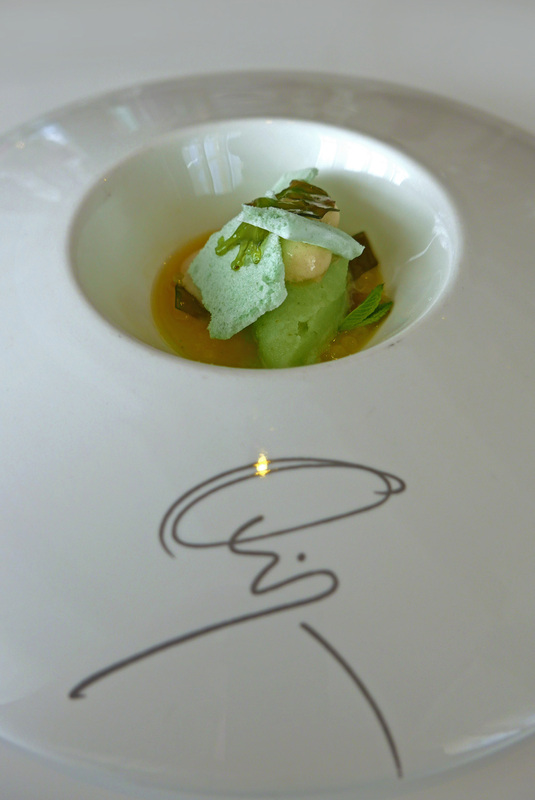 – Tuna, Artichoke, Edamame, Onion, Almond, Olive mousse.The Garlic shape was encasing liquid Gazpacho. 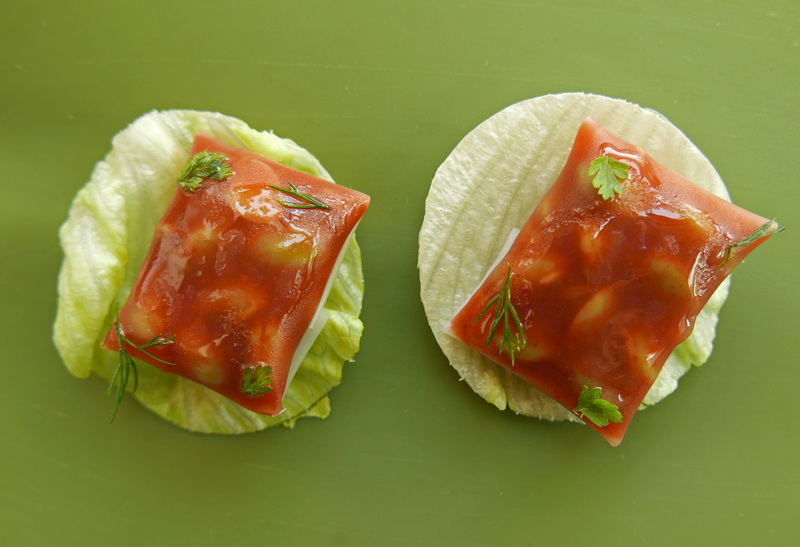 All resting on a thin jello of Tomato and Olive. 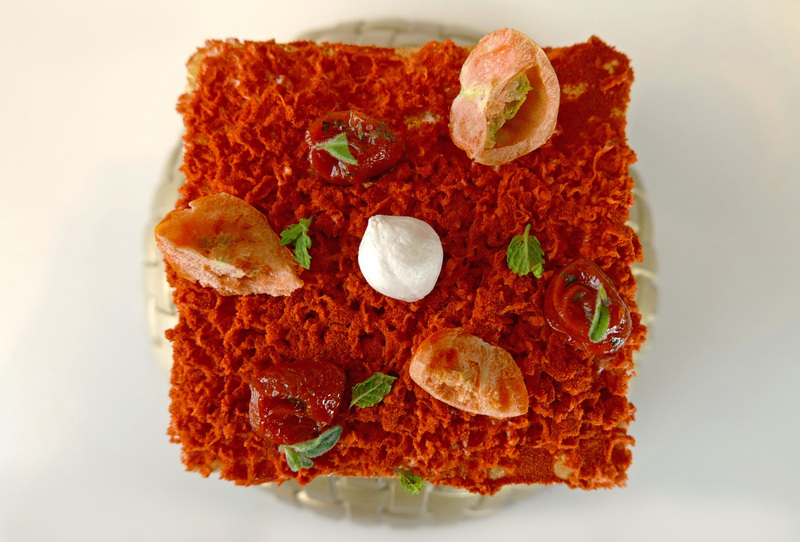 12, Coca of Tomatoes – A wafer thin square of dehydrated Tomato powder , big strong flavours here. 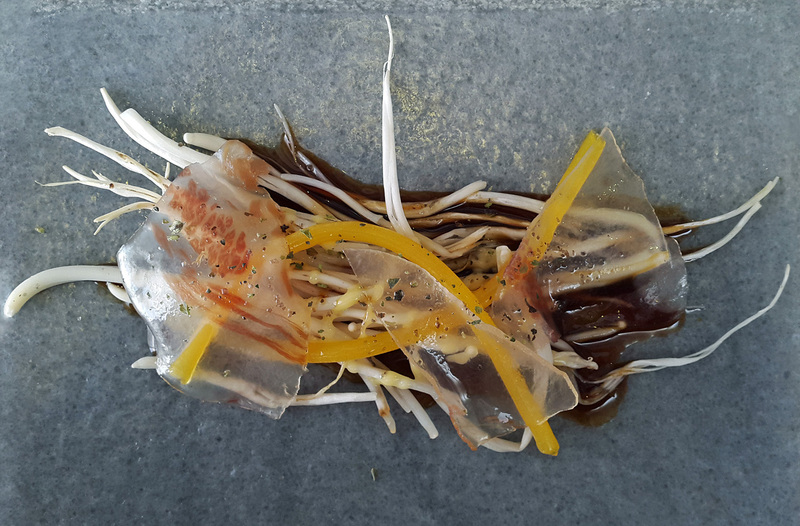 14, Dried baby Squid. 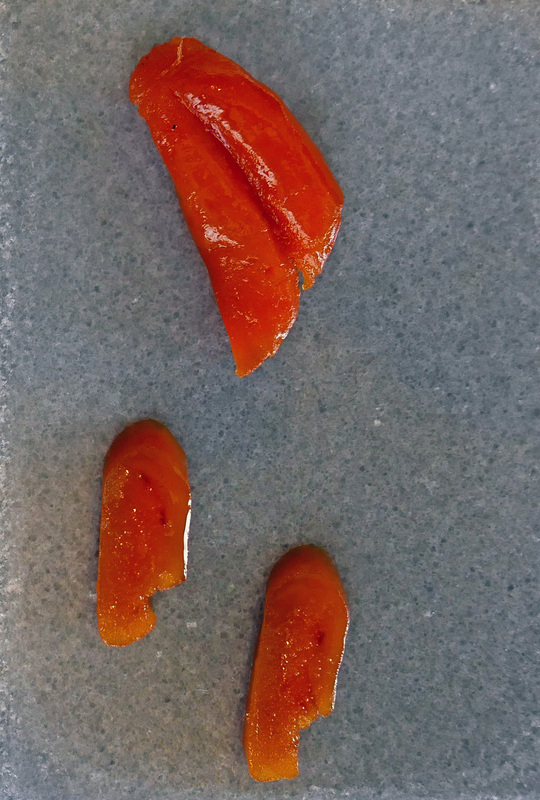 – These were a little too chewy and caramelised so the flavours of the seafood were lost. … Far from unpleasant though. 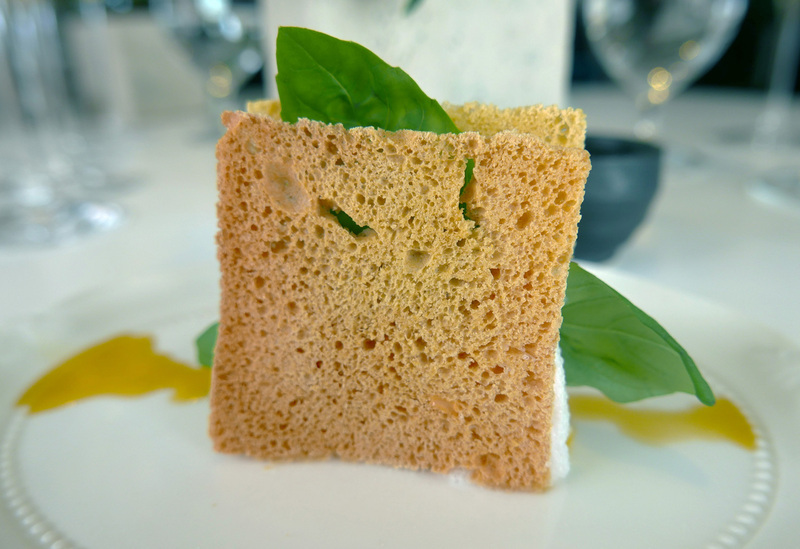 15, Ice cream sandwich of Basil and Tomato – Ice cream sandwich of Tomato foam with fresh basil leaf…. Refreshing. 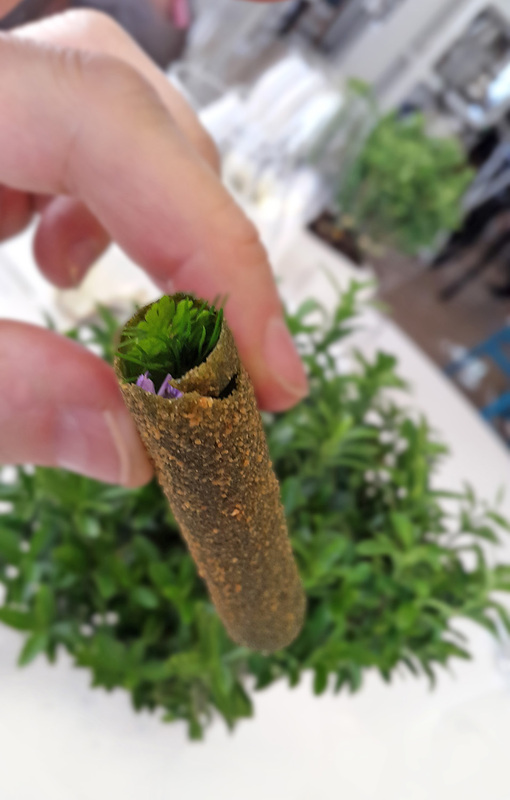 16, Herb finger with Lamb juice. – A plant for us to pick at using our fingers . 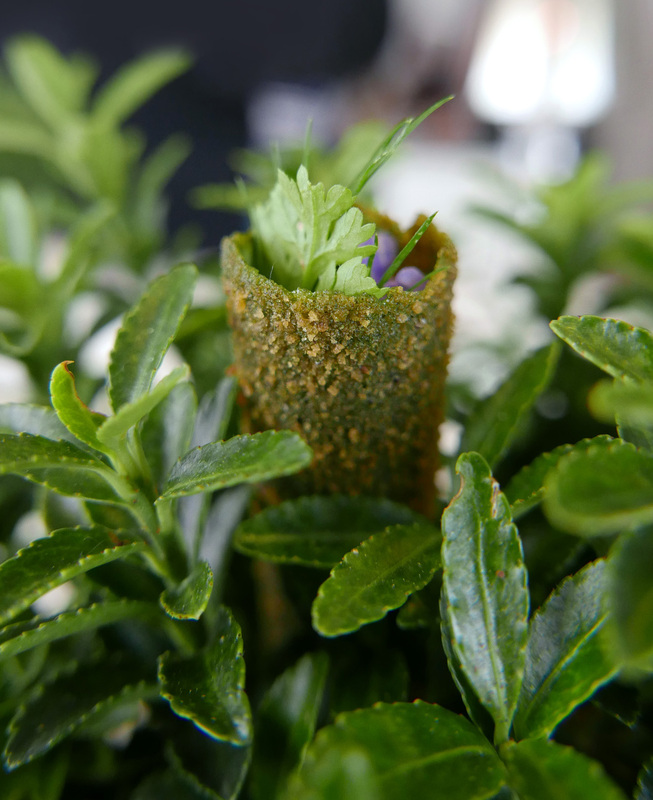 It’s herb crusted Lamb but a modern version…a crispy Almond tuile filled with a herb mousse inside. 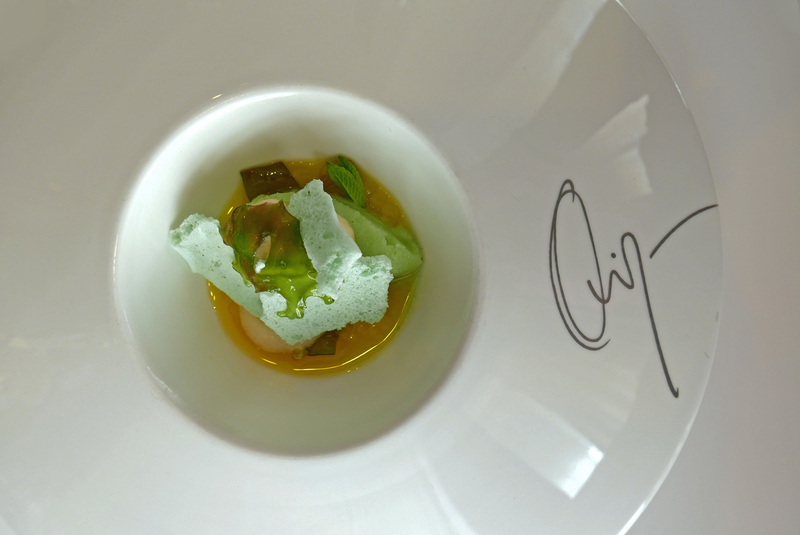 We were then instructed to eat it and then sip the Lamb consommé on the side. A good Intense flavour. 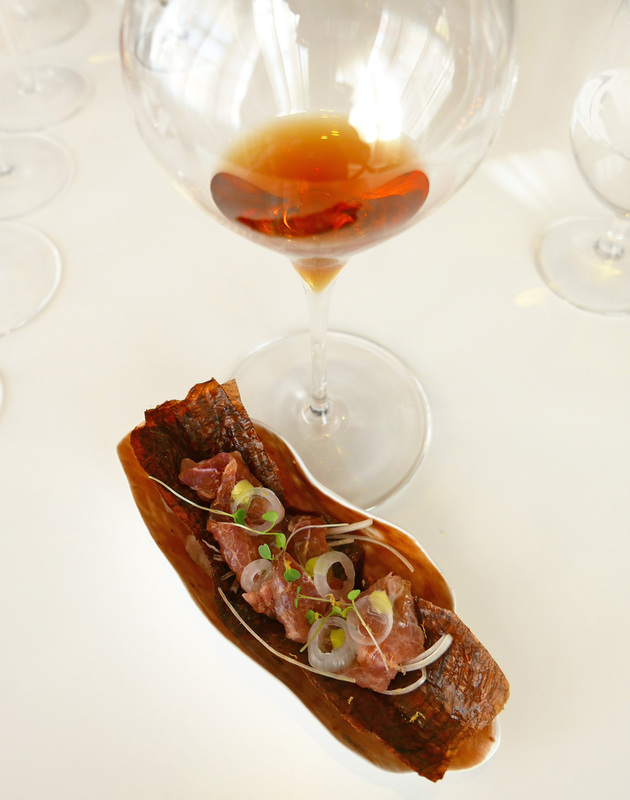 17, Tobacco leaf and “Toro” – Served on a Tobacco leaf crisp were slices of Toro Tuna and Dashi (Japanese stock) jello. The drink paired with this was a 100 years in the barrel Sherry which unfortunately masked the delicate flavour of this very expensive cut of Tuna. 18, Fish Lemon and half Lemon. 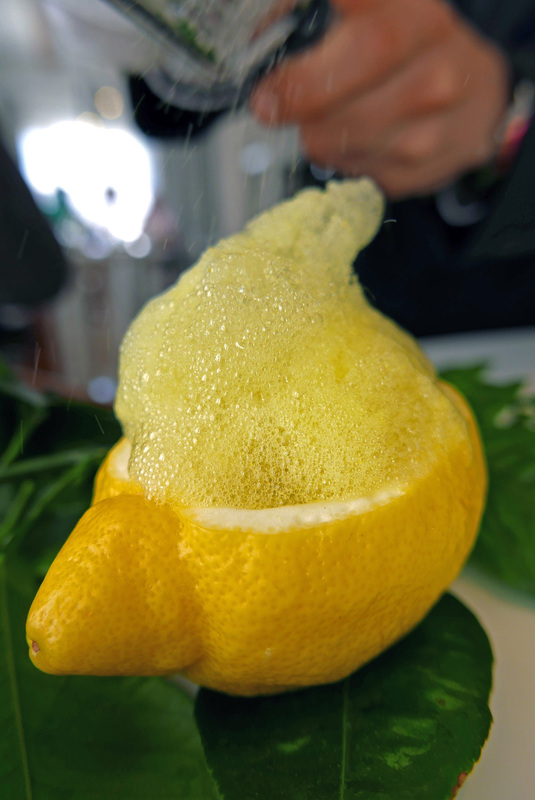 – A Ceviche course of “Fish Lemon in Lemon”. 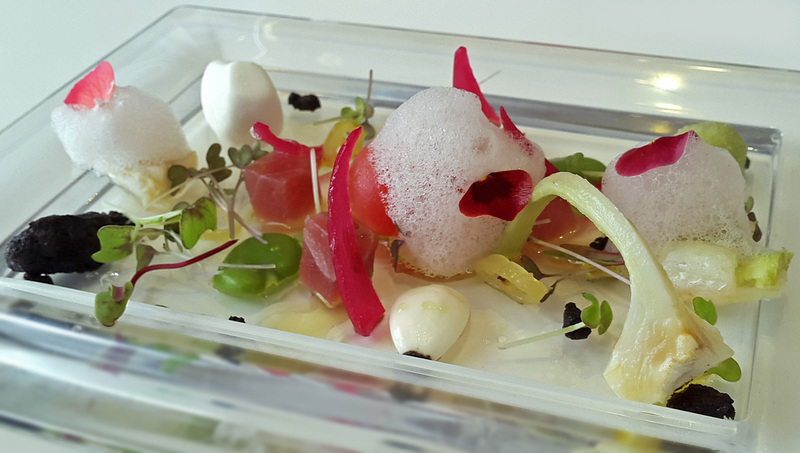 Chunks of raw fish (the sea is just 50m away from the restaurant) and the Lemon is from their own restaurant garden…..very refreshing. 19, Aspic of Crayfish. 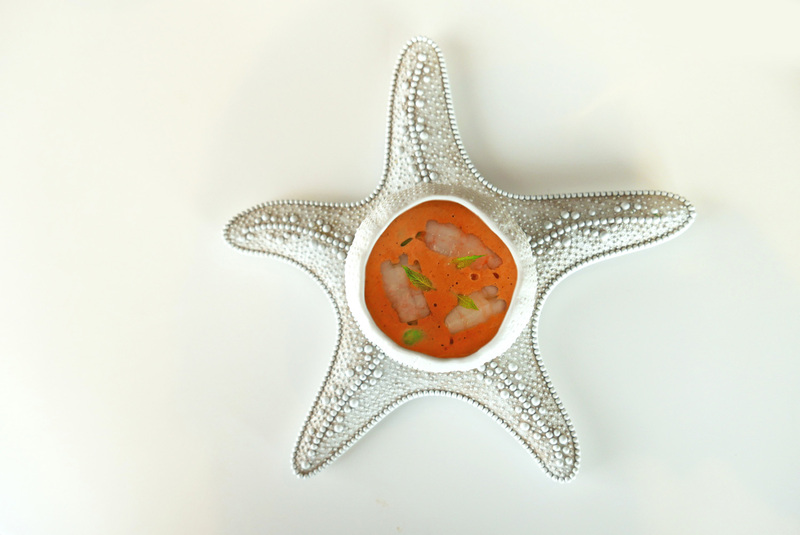 – Served in an Aspic was Crayfish Bisque with jello at the bottom made with the juices from the head of the shellfish. The flavours were very intense and quite spicy. 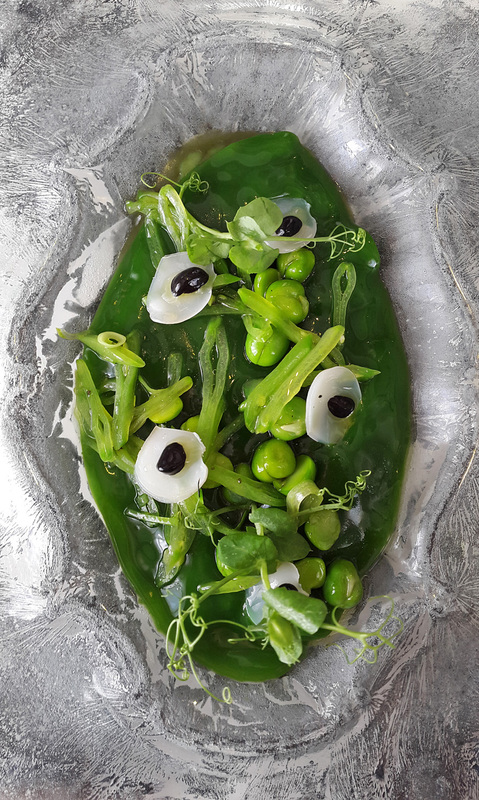 At the bottom of the dish were Peas offering bites of raw freshness and an interesting texture. 20, Sailor Knot – Tarhay. – Ok so i`m not so sure what the Tarhay means here. 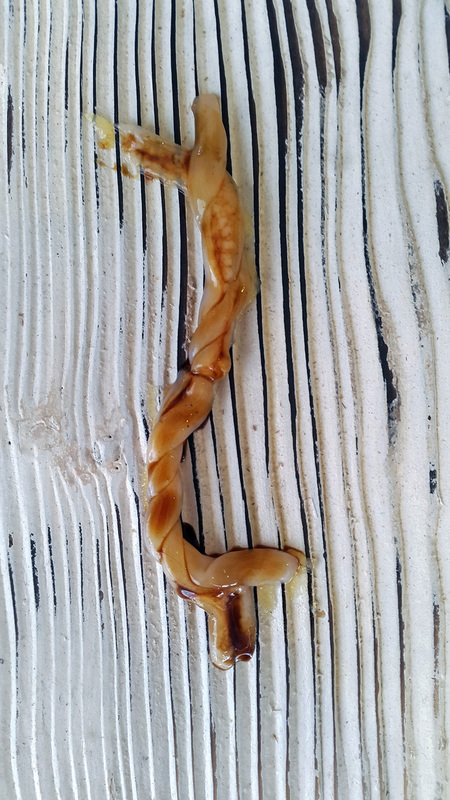 The Razor Clams were carefully wound together to resemble a sea knot. The Clam was delicate , Lemony and sweet. I notice that a lot of Quiques dishes were very sweet and no complaints from me as i`m just a sweet guy , and the end of the meal is the part that I always look forward to. 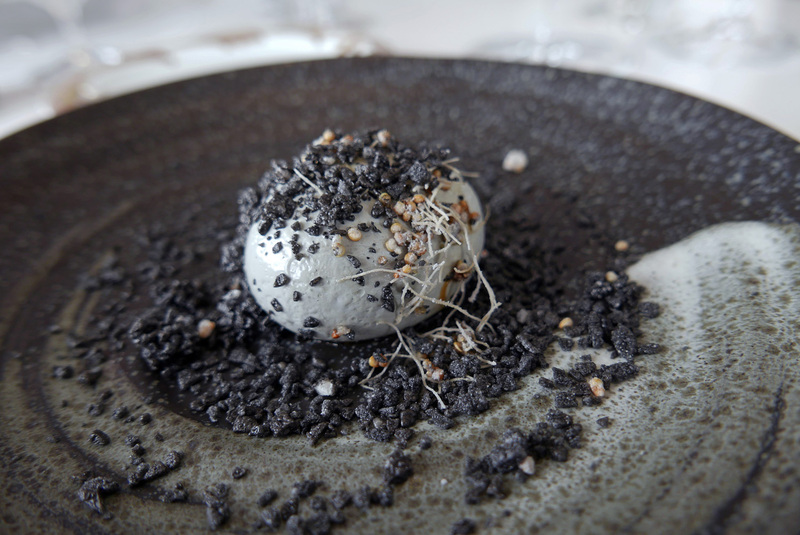 The other part of this dish was a tartare bathed in a light Hazelnut foam. 21, Carbonara. 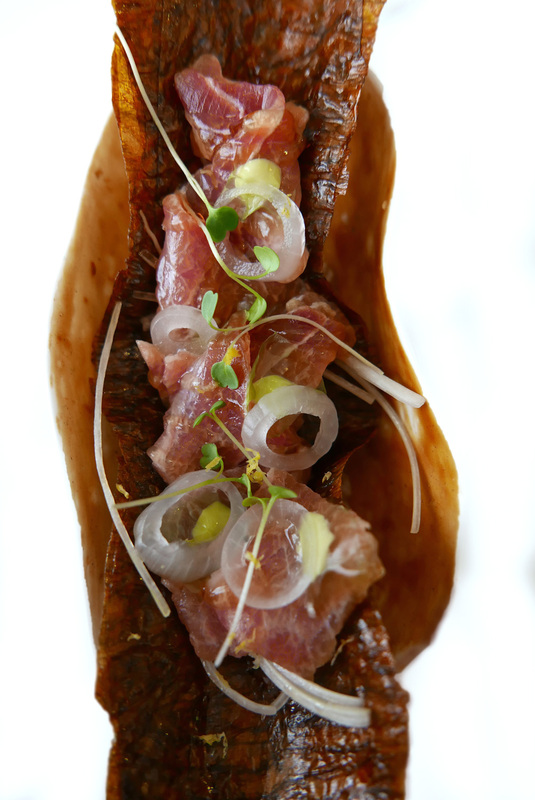 – Ultra thin transluscent Iberian Ham. Strands of Spaghetti on Enoki Mushroom. The sauce at the bottom was amazing ,sticky, powerful reduction from Pigeon and Chicken. 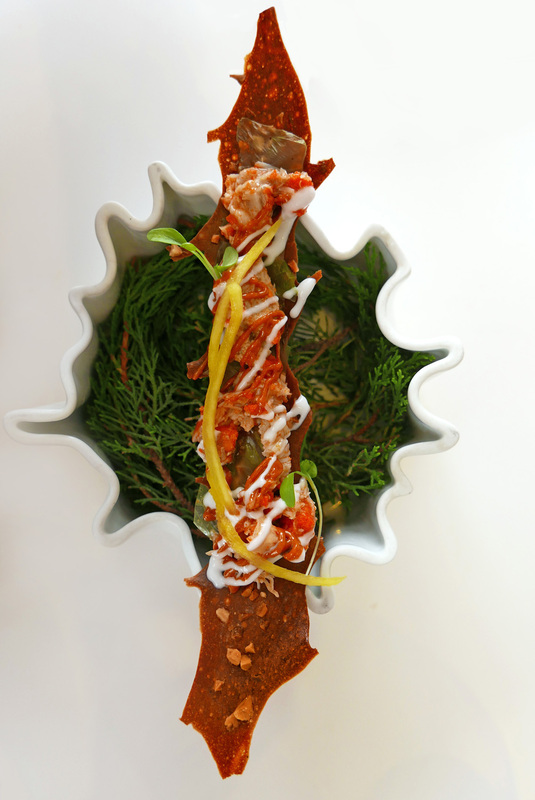 22, Satay of King Crab – Crabmeat, Crab roe, Mango, Peanuts , crispy, nutty and a spicy sauce. 23, Fried Oyster. 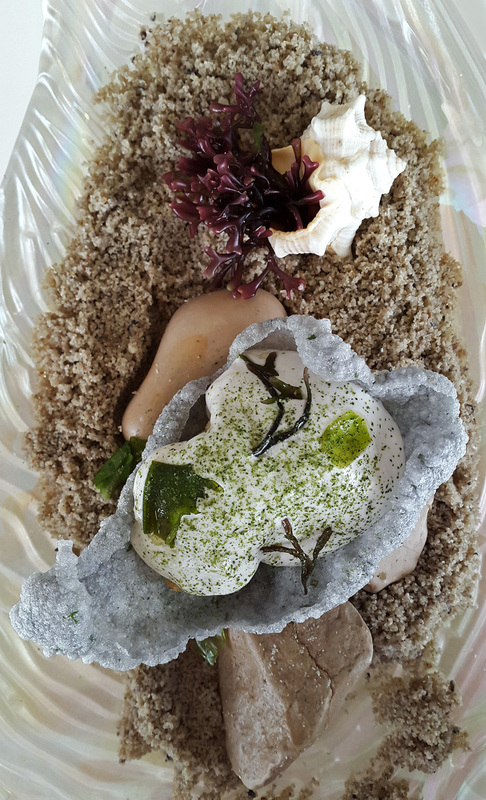 – Deep fried Oyster and Oyster cream. 24, Toast of Sea Snails. 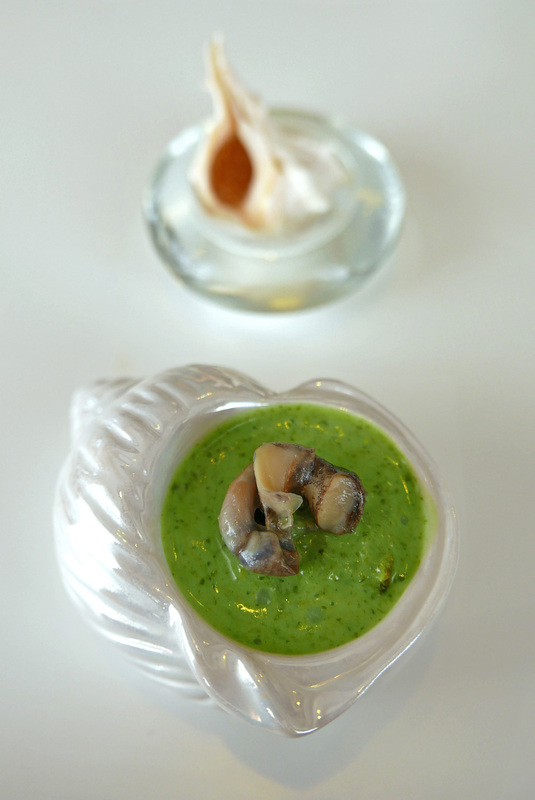 – Toast of sea Snail , served in little ceramic sea themed pots. Even the spoon was a sea shell. 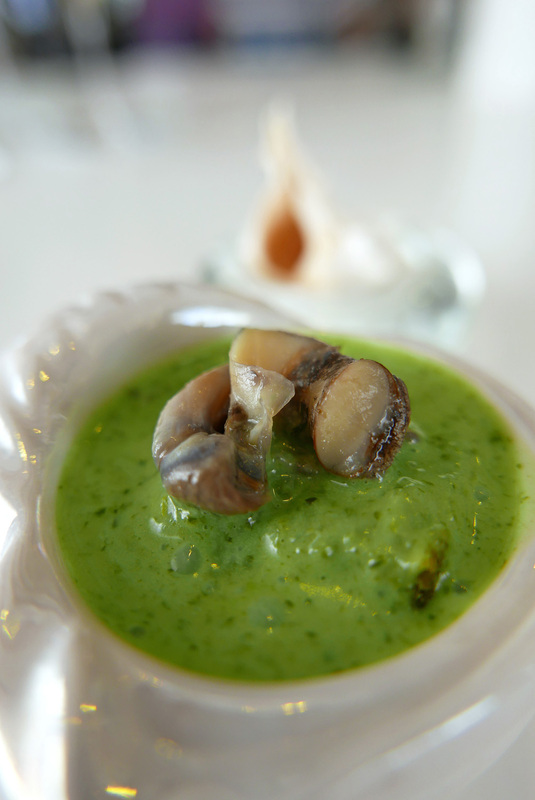 The Green sauce was made with Parsley, Olive oil, and Seaweed. 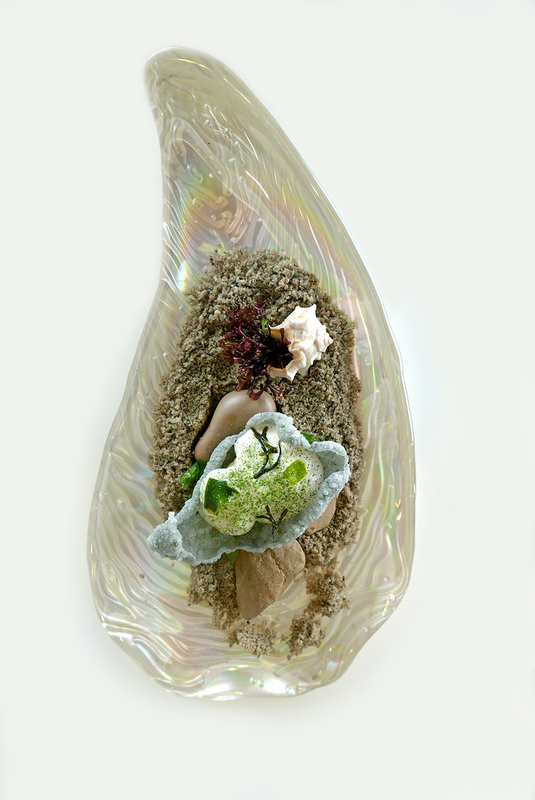 The small shell on the side contained little pearls of a local liquor. 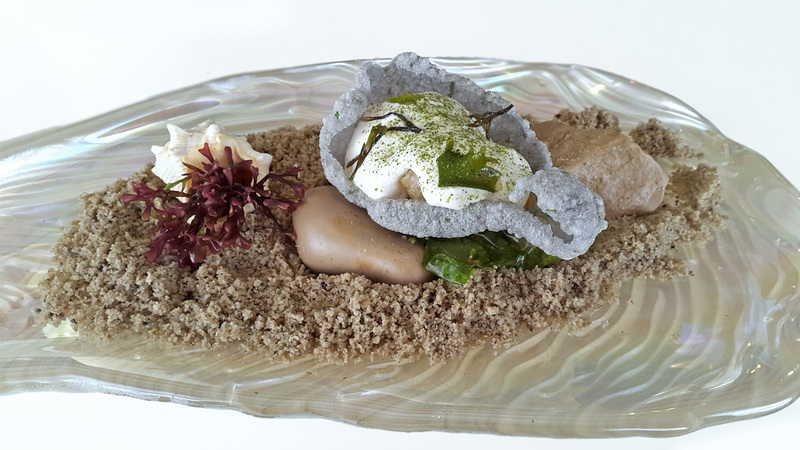 This course was inspired by a trip Quique had in Belgium to eat snail, but he created the sea version here. 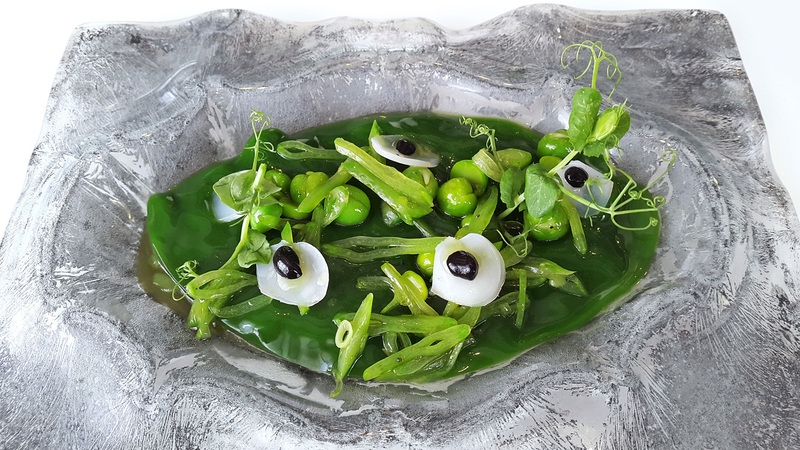 25, Rice “Albufera” of Peas and Cuttlefish Egg. – We were very close to the heart of Spain`s largest Rice production area,The Albufera area of Valencia. 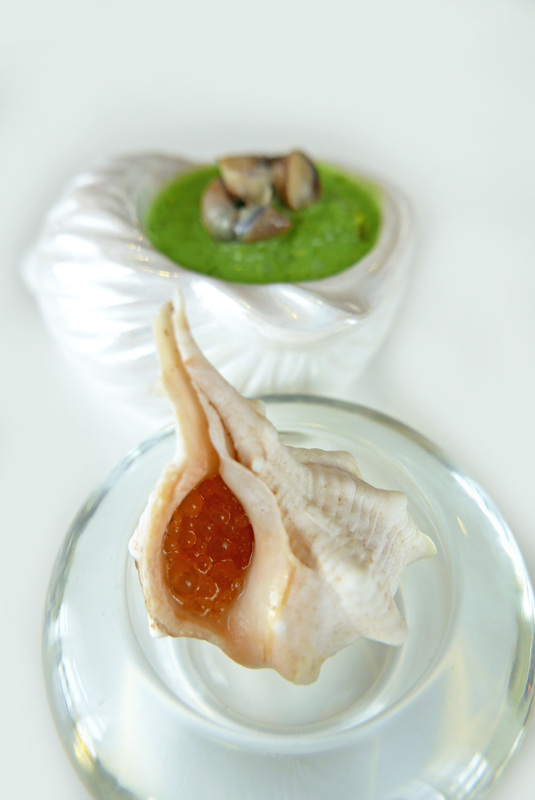 In this dish Quique showcased this product simply and effectively with Cuttlefish Eggs and Green Peas. 26, Pizzon al Funghi. 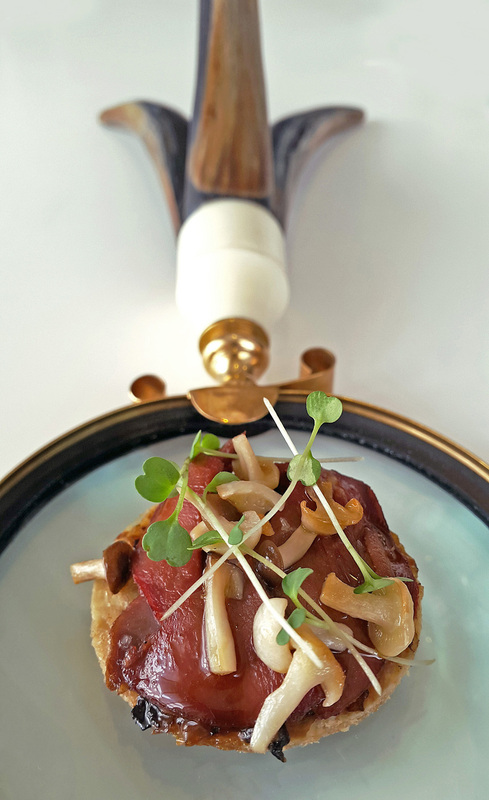 – Pigeon and wild Mushroom Pizza .Rather than a Pizza this is a very thin Pastry crust covered with small Mushrooms, tiny slivers of Pigeon and shavings of Truffle with a thick and intense pigeon reduction. It sits on a magnifying glass…..interesting and totally wacky. 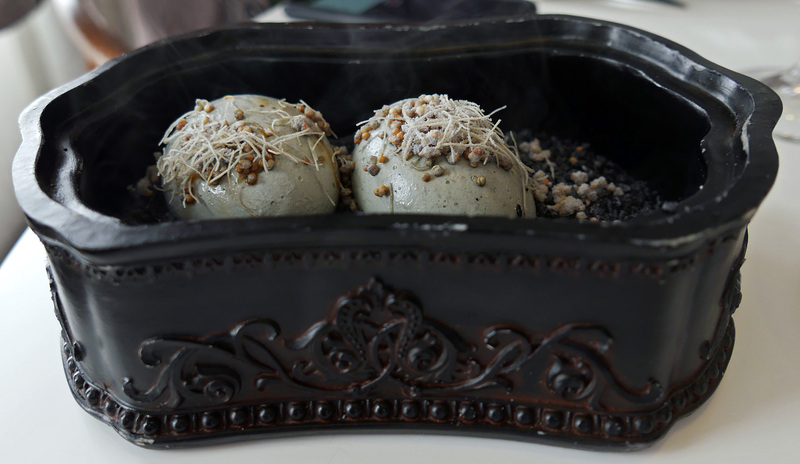 27, Egg in Ashes – Spherification was used here to mimic an Egg with a liquid centre. 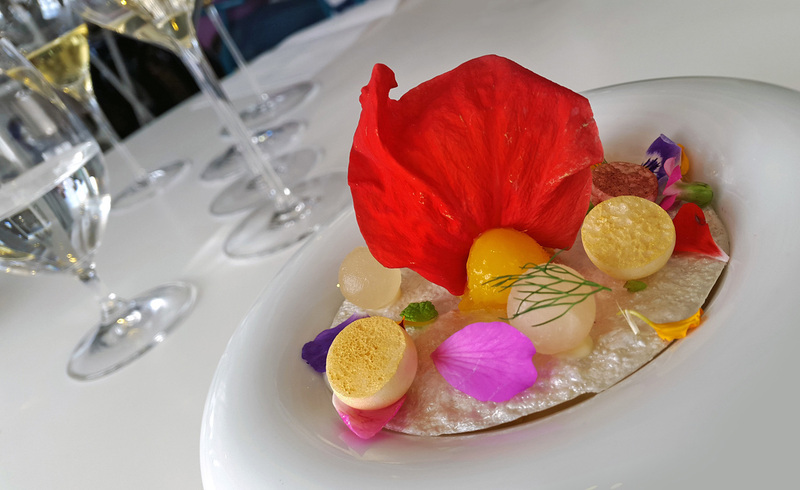 29, Strange flowers – Ohhhh this was stunning , highly perfumed and a delight to eat for a dessert lover. 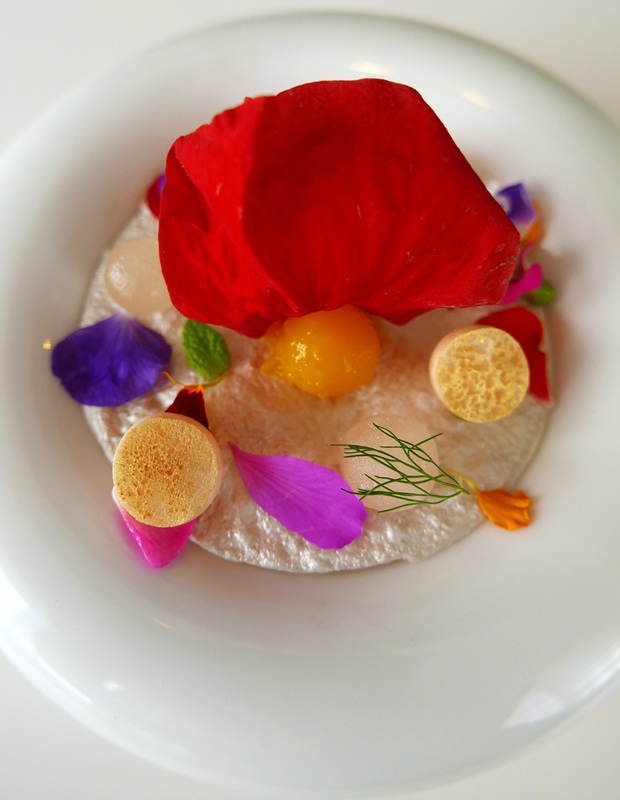 Mango puree with Passion fruit , Dill , Meringue , Lychee … Beautiful. 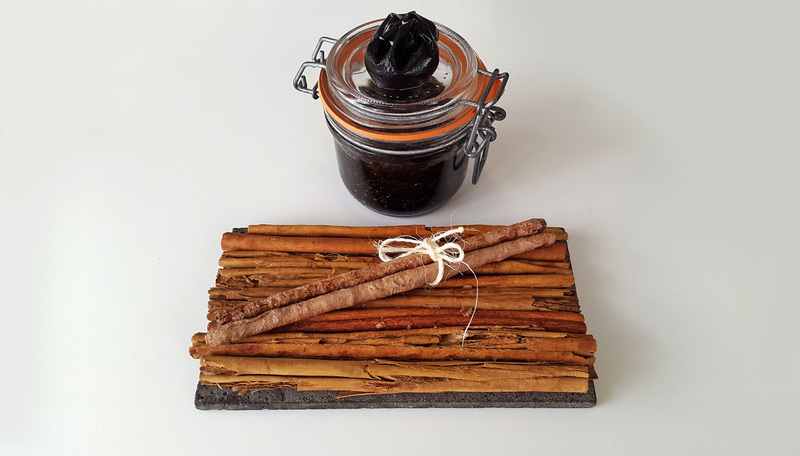 30, Cinnamon branch – Prunes. The Prune is actually not a Prune. 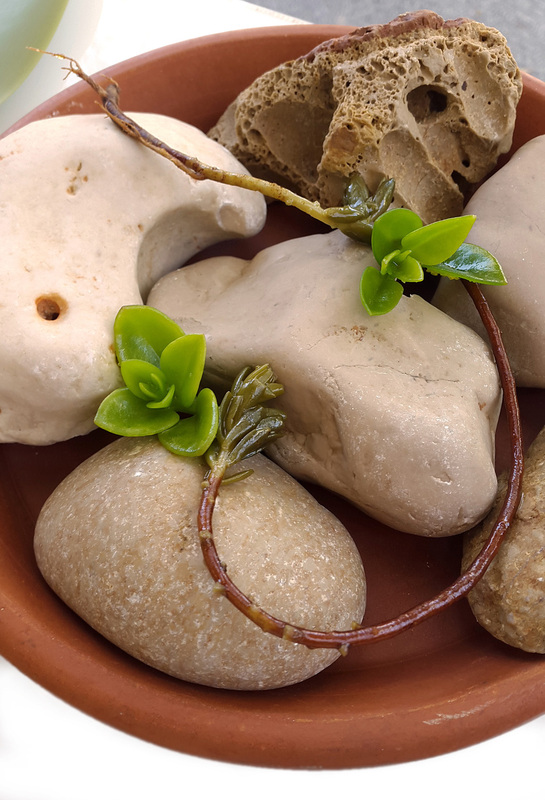 It`s an edible bag of Prune purée with an Almond inside to mimic the stone. The Cinnamon is actually not cinnamon. Good technique going on here and the main thing…..It tasted great. 31, Petals of Roses. 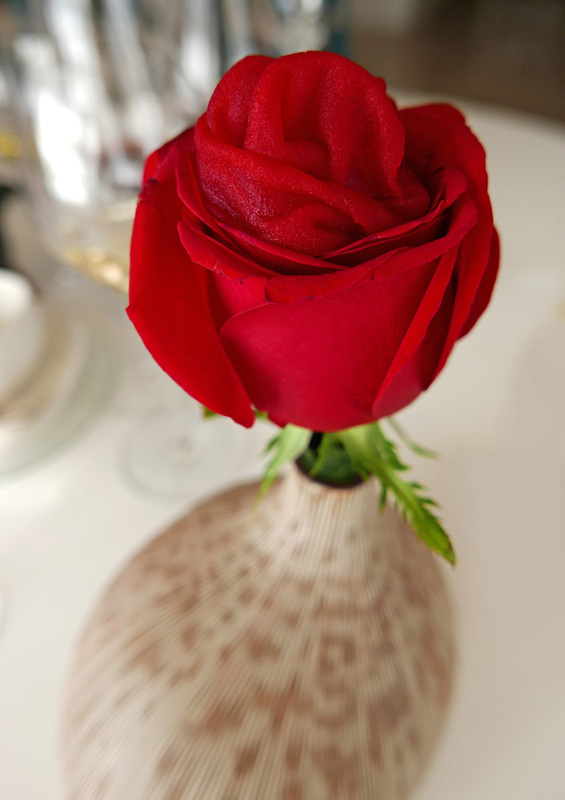 – This one arrived in a vase , it`s a Dacosta classic and because I had done my homework then I know what to expect otherwise I would have been eating petals. 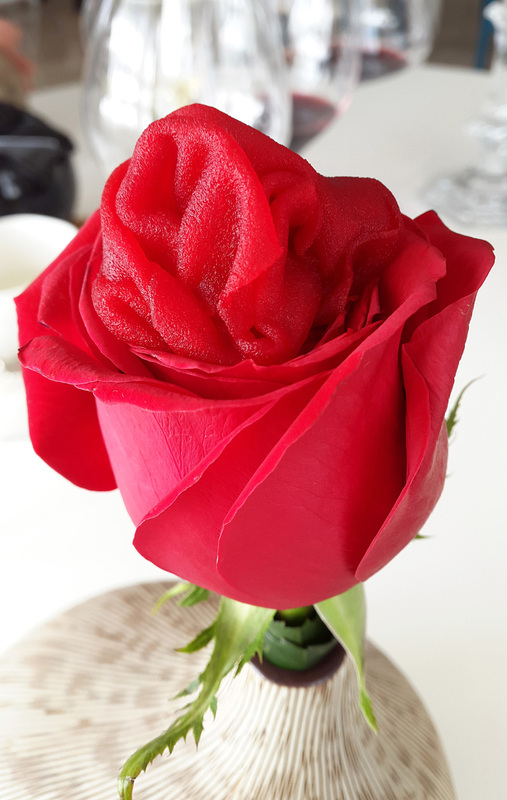 The inside of the flower is very carefully removed with knife and tweezers and then the Rose is filled with Apple shavings coloured with Grenadine and flavoured with Rose water. 32, Gin tonic of Apple…with hints of Juniper. 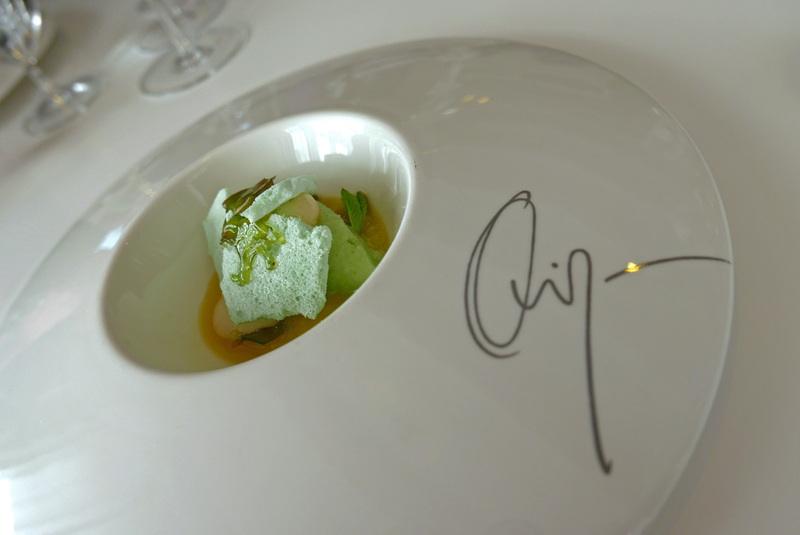 Ok to summarise my experience at the 3 Michelin starred Quique Dacosta….. Interesting , extremely interesting and a delight for anyone that loves their food with a passion like mine. 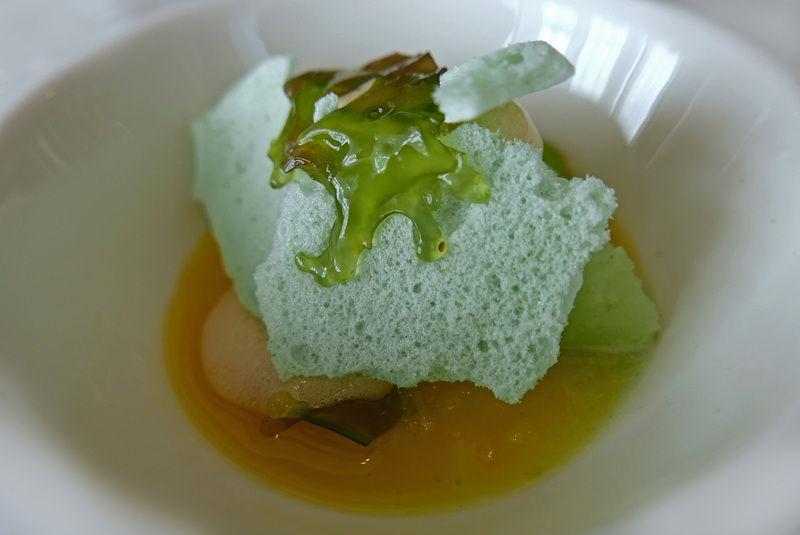 The food was inventive and exciting and although there were a few little items that I personally would “tweak” a little. All I seen was smiles , laughter and empty plates so someone is doing things right backstage. The Diners were happy so that hits the nail right on the head. Would I return ? Damn right I would…Loved it. 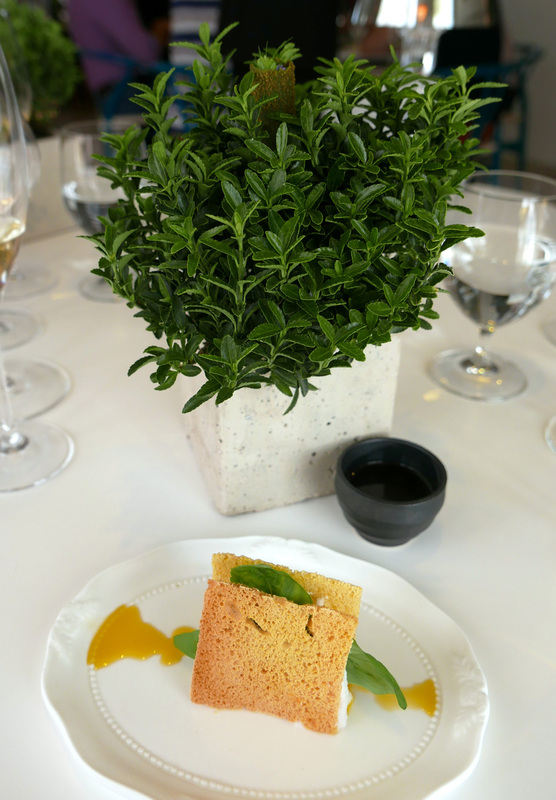 Click HERE to view all of the photos from the lunch on my Flickr account. 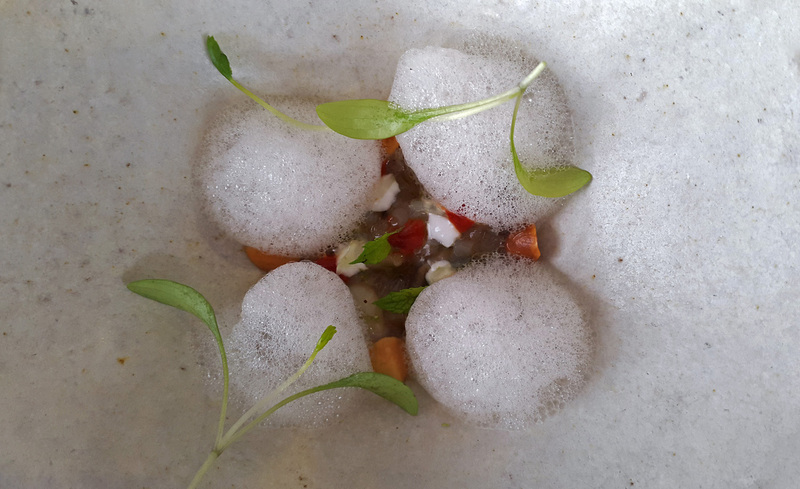 Previous Post Issaya Siamese Club Bangkok , Stunning Thai food in a beautiful restaurant. 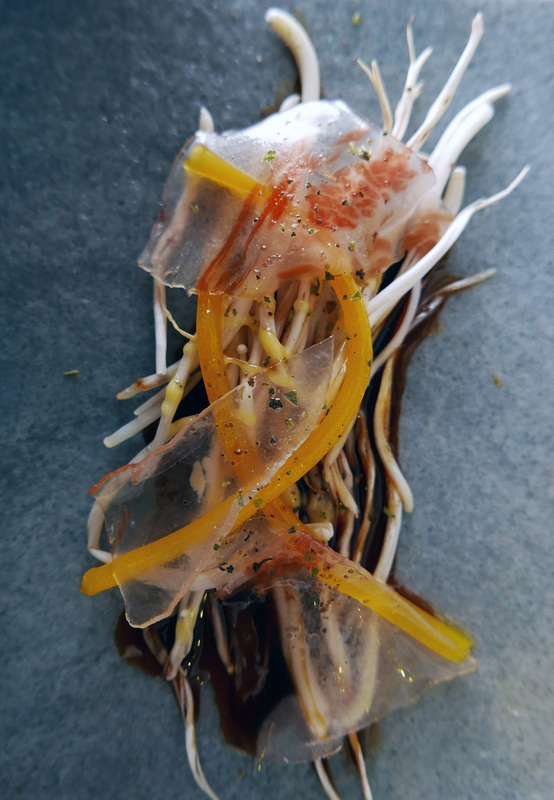 Next Post The Red Denia Prawn….Best in the World ? Good grief man, you must work out a lot; or have a fast metabolism!